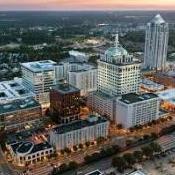 So why we here in Va Beach and norfolk were thinking we were all big and bad, P-town layed the smackdown on us!!!! . Way to go Portsmouth, I have never been so proud of that city as i am right now. Is it just me, or do these buildings look extremely tall! (and not one of them has a spire). Ok, last post of the evening, i promise. . I think this is really going to cause Va. Beach and Norfolk to step it up a notch. I also think, that with the addition of this project, we are on the cusp of a Charlotte style boom here. With the announcements of the last few weeks, i really think we've hit critical mass. Looks good. Hopefully more info will be out soon. Looks good. Hopefully more info will be come out soon. Well, apparently this guy already has developers lined up and in fact one of them presented their designs for a highrise tower for one of the sites listed in article (the holiday inn site) immediately after the developers presentation. This looks like this is going to be a collaboration of sorts. I'm going to check P-towns website and see if they have any renderings up or at least a video of tonights council meeting (and their presentation). I'm gonna post this rendering in the Norfolk/Portsmouth skyline thread to see if people may be able to do some rudimentary photoshop based off of it. Were gonna need some different skyline pics than the ones we already have in order to properly view both skylines. That is truly amazing! P Town is on the way up indeed! Amazing development. I am so glad for them. It's important to remember these are only concepts. Does anyone know if Portsmouth has established this area as a redevelopment zone? Has the city put out RFPs (requests for proposals)? What becomes of the area depends on what developers actually show interest and make proposals. also, who is going to pay for and how are they gonna pay for all of these seemingly expensive road projects and the relocation of cityhall and the city jail. That kind of stuff isn't cheap and I don't know many Virginia cities that can shell out that kind of cash without a tax increase or bond referendum. The rendering is awesome but it is still very early yet. If this comes to fruition though, then congrats! As stated in the article, one developer presented his plans for a highrise on the holiday inn site immediately after this guys presentation. So at least one of the 6 is in planning stages. It was also stated that he was in consultation with other developers. I don't think he would propose something so massive if there was not at least some possibility of it coming to fruition. This will probably be more like Towncenter, in that it's done in stages over several years. We will probably see many changes to the plan before all is said and done. Also, I believe the city already owns the targeted areas. I may be mistaken though, i'll have to look at the article again. I wonder what the buildings are for? Can this area support all of this growth and do we see a slowing in the near future or do you think we are just playing catch to where we should have been. I was a bit concerned about that too. Will they be condos, offices, hotels?Too much, too fast could be a very bad thing. Hopefully, HR has just been severely underutilized in the past and can sustain this building boom. Last thing you want is for one of the projects to be a dud, and scare future investment away. I was reading a report last night, I don't remember what magazine (ill try to find it again and scan it into the computer). It was about residential and condo demand. Basically it stated that we have not seen the increases that other area have in home values. Some of the larger metros, are seeing 100% increases, while we were only at 34%. The reason that this is important is that we are having all of the same benefits of all of the large cities, housing demands and shortfalls, but without the huge increases in cost of living. Basically the reason that people are finding this area as home and the pent up demand for housing is because it is such an inexpensive place to live, but has all of the amenities the larger cities have. It went on to say that larger metro areas will probably mellow out in the near future because of such expensive housing, but that this area will continue to be undersupplied for many years. There just arn't enough homes, condos, apartments for people to live in. Basically, people who don't live here are buying homes as second homes, there is short supply anyway, so the consensus was that this is only the tip of the iceberg. I got the feeling that these condo projects are only the tip of the iceberg. I think they were just the catalyst to get the ball rolling, and its all downhill from here. I think Charlotte will steady in the next few years, but you will see our area just steamrolling because of this demand. Let's see, 5,000 new military jobs coming to southside, a new terminal opening, the airport continues to have gains in traffic, shipping headquarters continue to move here, out of town developers are getting into the game. Yea, I only think this is the tip of the iceberg. Yeah, i believe we even posted an article on this site that notes that demand will be greater than supply for many years to come. In the article it states that there will be a mixed use component for this but it will be mostly condos. That being said, i believe we were debating on the site a few months ago how underutililized (is that a word?) Portsmouths coastline is. This has been coming for a long time and condos built there will have the best views in the region. Developers are probably falling all over eachother for that prime real estate. I'm not that concerned with too much coming online at once simply because i don't believe they plan for it to happen that way. The tower going on the Holiday inn site probably won't start til at least the end of 06 judging by the time it normally takes for one of the major projects to completely go through the approval process. Everything else will probably be demand oriented and will be scaled back (or hopefully up) as the developer sees fit. The days of speculative building and empty towers ended in the 80's. This region, in particular, learned its lesson the hard way. Isn't the developer that's putting together Portsmouth's "revitalization" the same one that worked wonders with Norfolk? If so, then my mind is very much so at ease on this one. Portsmouth's harbor has unparalleled (sp?) views of Norfolk and maybe (after this project and maybe others) it'll have an impressive skyline of its own. I hope that they do make it truly mixed-use though, or balance it out with more office/commercial development in Norfolk. Isn't the developer that's putting together Portsmouth's "revitalization" the same one that worked wonders with Norfolk? I believe it said somewhere that he was (aka the one responsible for having Buddy Gadams change the Granby design ). If so, that's great news. I counted 20 floors... but then again I could hardley make out each floor when I zoomed in. Hmm... I didn't see it say this in the article. Name does sound familiar though. I'm pretty sure he's worked in this area before. I counted 20+ though it's really hard to count them. 2 buildings at the bottom of the rendering are cut off. The one at the very top looks to be in it's 30's though the floors on that one are way to small to count. I was thinking the same thing about the building at the bottom. It was 16 floors from the part that I could count but below that, it looks to be similar height to that point. I'm so excited about this latest project! It appears this is going to happen. Even though this is in Portsmouth it's going to add big time in the overal downtown area. Yeah, i believe we even posted an article on this site that notes that supply will be greater than demand for many years to come. I believe you mean demand will be greater than supply.